Cilantro: Thank you EC for giving me this opportunity. Cilantro will turn ‘2’ in Jan 2010. I am a homemaker living in the beautiful State of Washington. Apart from cooking, my hobbies are travelling, gardening, music and photography. Cooking has always been my passion from a very young age. I started helping my mother with small chores in the kitchen from the age of 10 and later managed to cook a decent meal before my marriage. With the guidance of my mother and mother-in-law, I learnt the techniques and nuances of cooking. Having lived most part of my life in Hyderabad I was introduced to a variety of cuisines from India and along the way managed to learn a few of them. I believe cooking is an art and any art needs patience. A small dose of love and patience will help create a great tasting meal. I usually post one recipe a week, but I do not cook specially for posting it on my blog. I take pictures of what I cook and document them. The reason for starting my blog was my interest in cooking and also to maintain a cookbook for my daughter. EC: Who and what inspired you to start food blogging? Cilantro: My Mother had gifted me her handwritten recipe book and I wanted to do something similar for my daughter who is my foremost inspiration to try new recipes. Looking at Mahanandi, Sailusfood and other food blogs, I was inspired to start CILNATRO which would eventually become a gift for my daughter. EC: How did u come up with this blog name. Also tell us something about Cilantro-nized recipes. Cilantro: Cilantro which has a special place in Indian cuisine is also one among my favorite herbs and hence my blog name CILANTRO. I wanted to name my blog Cilantro and never did I check if one existed. I have a section named CILANTRO~nised where a Non-Indian recipes are modified with the spices and ingredients familiar to Indian cuisine. Cilantro: Biriyani is a favorite among my Indian guests & Butter Chicken among my Non-Indian guests. EC: Your pictures are so attractive..Pls share some tips for food photography..
Cilantro: This is a great compliment for me. I am yet to learn a lot about photography and therefore I do not consider myself an expert to give any tips. I read a lot about food photography on other blogs and find answers online. What I do is: I take multiple pictures of the same dish at different angles and settings. Natural light which is very important for food photography is rare in Seattle so I adjust the white balance accordingly. I take pictures in Macro mode with a low ISO setting and use timer along with the tripod. I use tools like Flickr & Picasa for editing the pictures. EC: The recipe index has a variety of cuisines. Which one do you love to cook and enjoy the most? Cilantro: I always love cooking Indian Food and enjoy them as well. Cilantro: My Mother-in-law during her visit to the US met with her very old friend after a long time. During their conversation her friend had mentioned trying the Murukku recipe from a food blog that she had been following and she had printed copies of other recipes as well. My Mother-in- law was pleasantly surprised to see that several of them were from Cilantro and mentioned to her friend that CILANTRO recipes were actually from her daughter-in-law! I was equally thrilled to know about this incident. Cilantro: Each recipe in Cilantro is tried and passes out only if approved by my husband who is great critic. 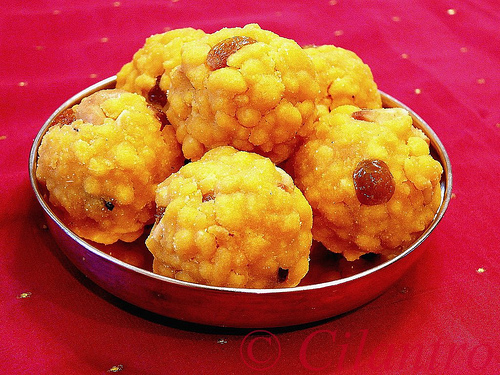 If I were to choose one then the first post is always dear to me, therefore I choose Boondi Laddu. Loved looking at Cilantro's food and other pictures. Great spread, cilantro. Thank you EC for the opportunity. I am glad & honoured to be featured here. IT was nice knowing more about you Cilantro. Really nice to know more about CIlantro, just love her blog..